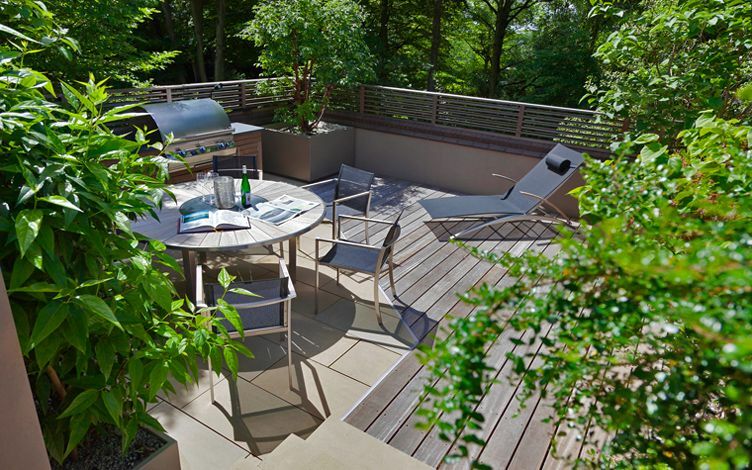 Located within a private woodland in Highgate, this small roof garden atop a scenic hillside offers seclusion and tranquillity. 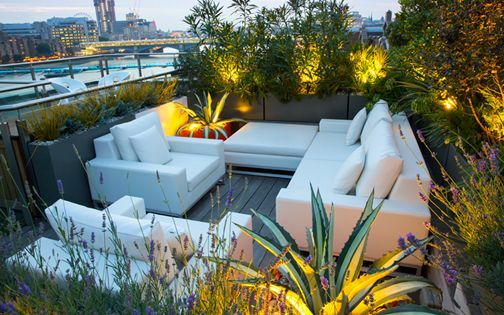 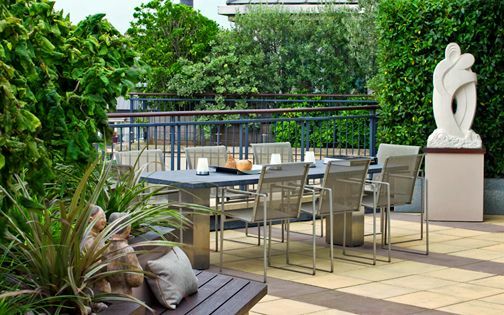 Situated above a parking space at first-floor height, the intimate roof garden adjoins a small study on the home's mezzanine level, where its cosy squared outline was redefined with angular hardwood decking, buff sandstone pavers and outdoor lighting. 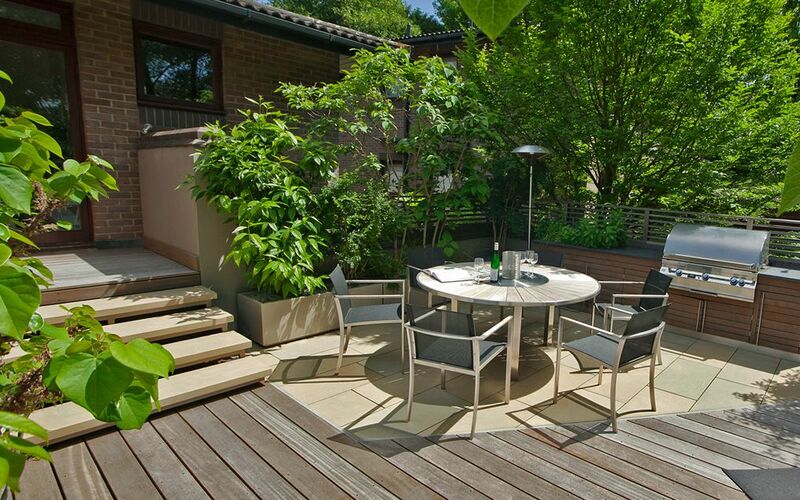 The natural materials palette of warm earth tones and lush layered foliage complement the distinctive verdant scenery of this picturesque part of North London. 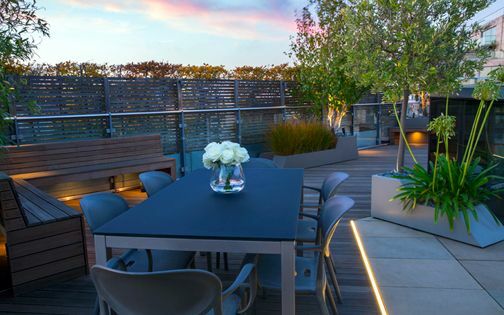 Although the private homes of Highfields Grove feature conventional brown brickwork, their interiors are modern, and this rooftop garden required updating to fuse with our clients' contemporary mindset. 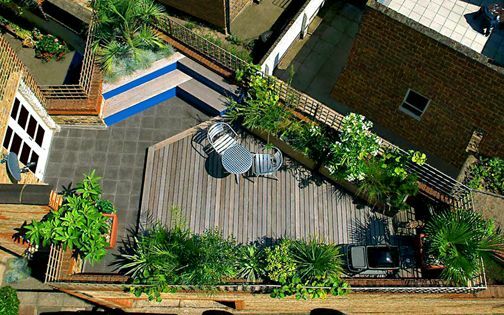 The garden's square outline felt distinctly static, where we sought to add movement, and delineate a greater sense of space. 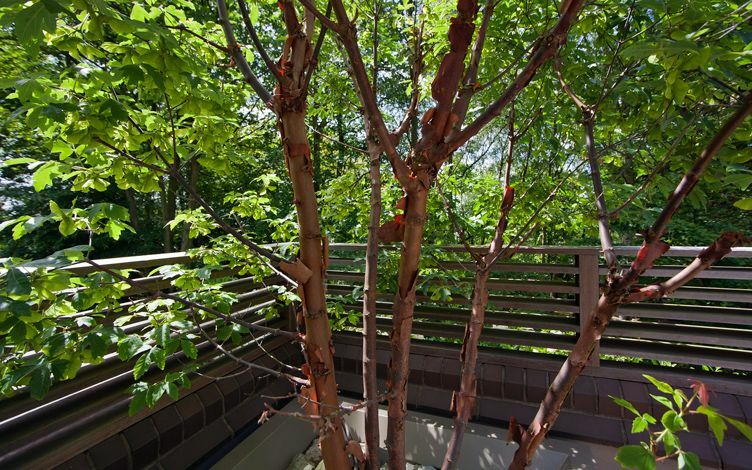 The deck design accomplishes much spatial depth, angled towards a Paperbark maple – the sculptural tree blends beautifully into its woodland in texture, deciduousness and seasonal diversity, forming an architectural focal point. 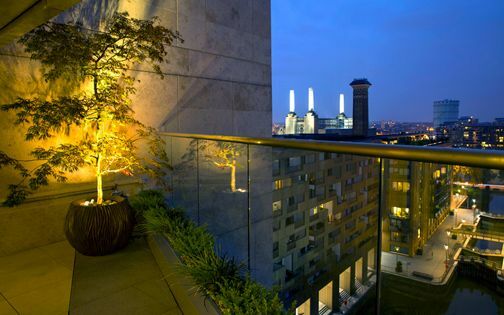 Living and working within North London's verdant landscapes, we often seek to elevate foliar qualities across Hampstead rooftops and Primrose Hill gardens to accentuate their natural backdrops. 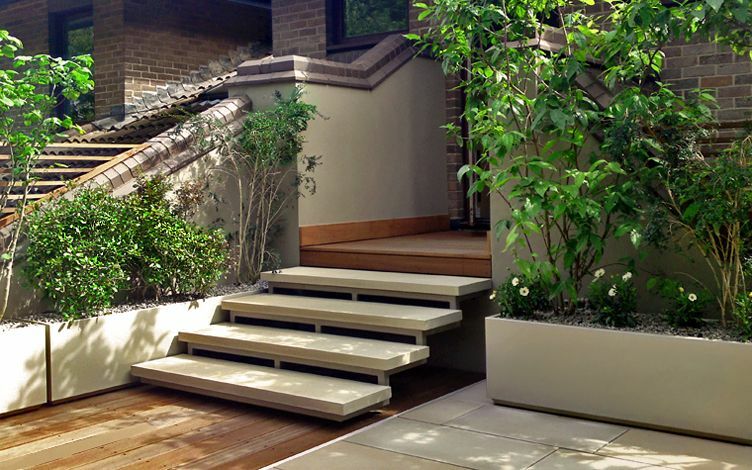 A five-step spacious staircase leads down into the cosily west-facing small roof garden, creating an elegant natural transition, constructed in floating sandstones which hover a powder-coated steel frame. 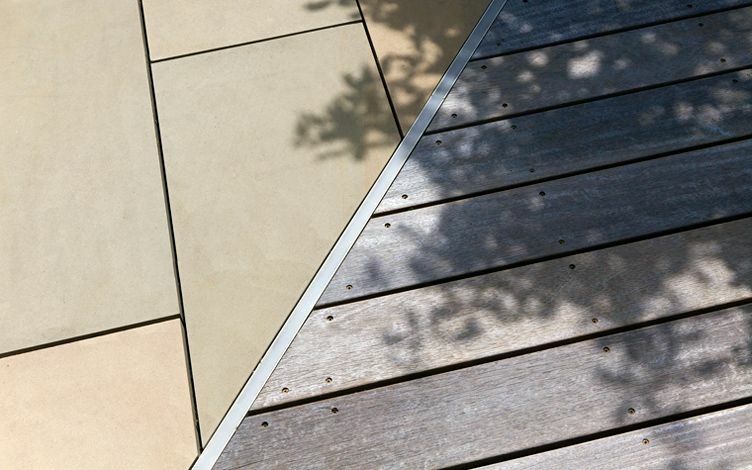 The 1.5-metre-long buff treads produce ergonomic effectiveness within a streamlined detail design, emitting a warm glow below, while a linear LED strip light demarcates the deck's layout, distinguishing the stone and wood sections. 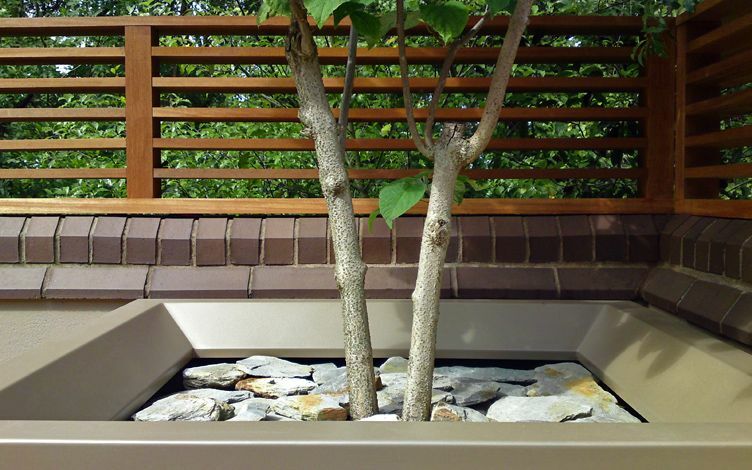 Custom-made troughs and tree planters feature a floating shadow gap beneath, achieved by specifying integral plinths or suspending the units onto polymer discs. 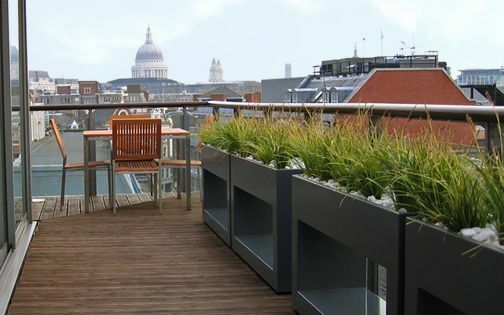 We continuously extend this original signature detail in every roof terrace design we develop, to merge distinct compositional nuances with augmented drainage methods, amid a dynamic shadows and light interplay. 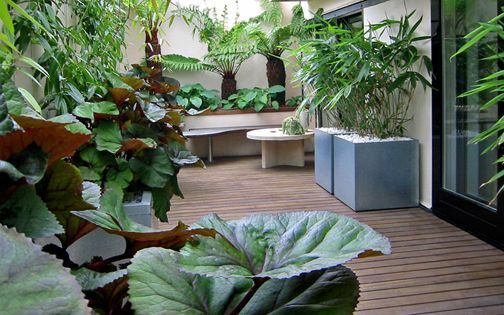 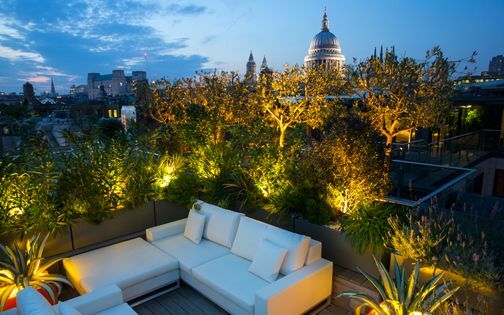 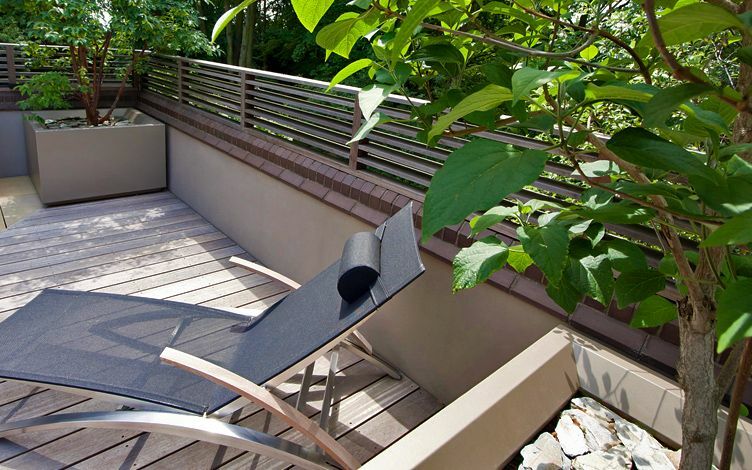 A hardwood screen surrounds the roof garden, adding safety and a sense of enclosure above existent low parapet walls. 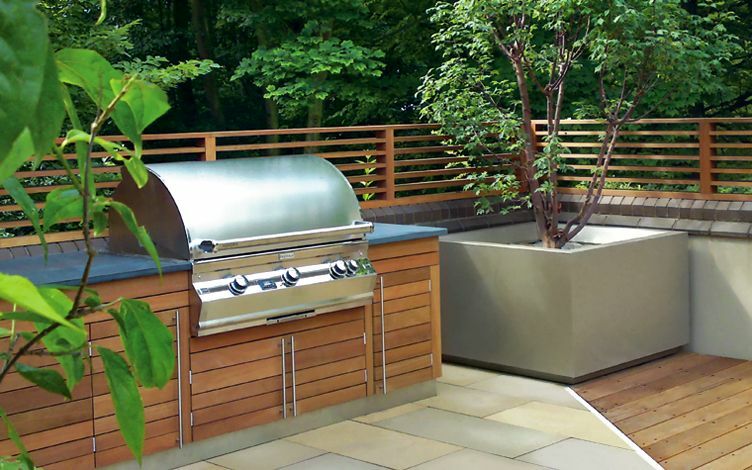 The Balau wood is further detailed in a built-in barbecue design, where a sizeable gas rotisserie, slate worktop and stainless steel detailing are integrated seamlessly alongside a recessed herb garden which provides handy culinary foliage. 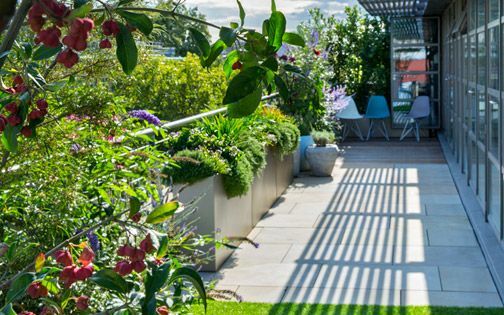 Set within a lush woodland enclave, the small roof garden is immersed in morning sunbeams, contrasted by afternoon shade – a complete microclimate which sustains a broad planting spectrum. 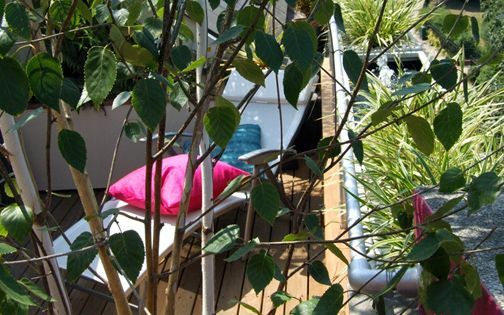 A Harlequin glorybower infuses heady fragrance in late summer, while a scented Wintersweet is highly valued during the colder months, juxtaposed with Eastern redbud cultivars. 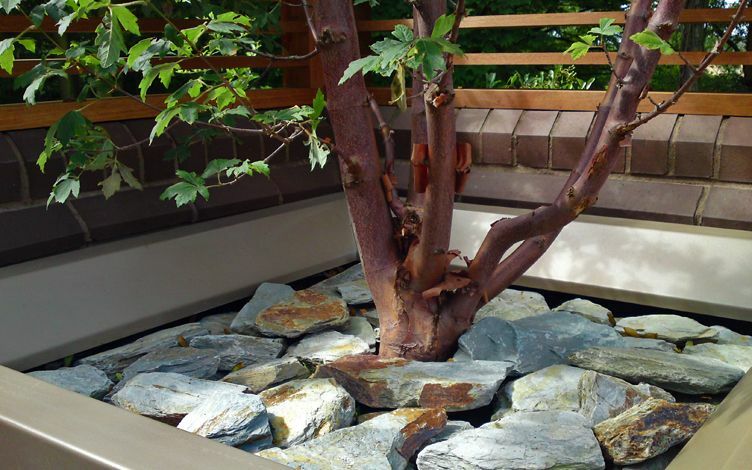 A specially designed tree planter displays a multi stem Paperbark maple, and with a private drive leading up to the residence, manned by an in-house design & build crew, we utilised a small furniture lift to haul heavy materials, tree specimens and oversized components. 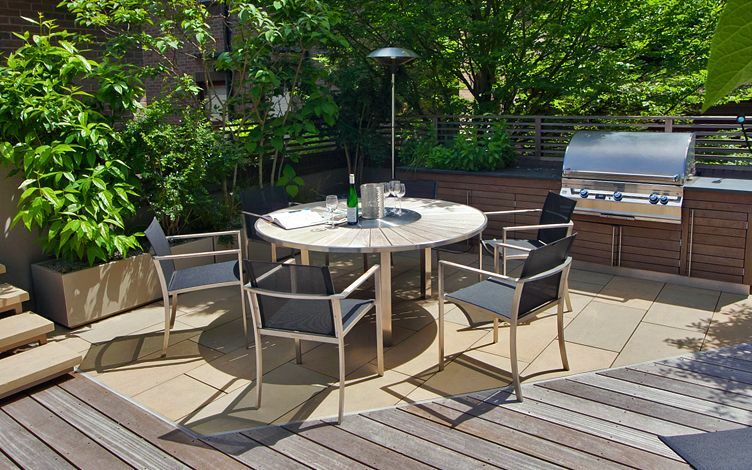 The planter's top edge is folded at a 45-degree angle, reiterating its base detail, and producing a cohesive lightweight appearance overall. 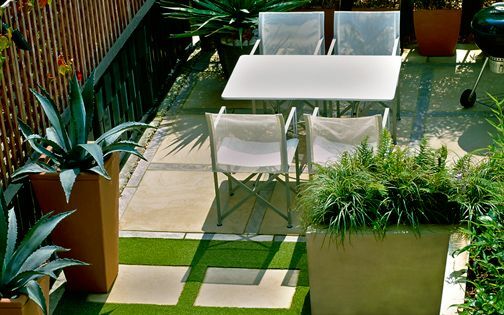 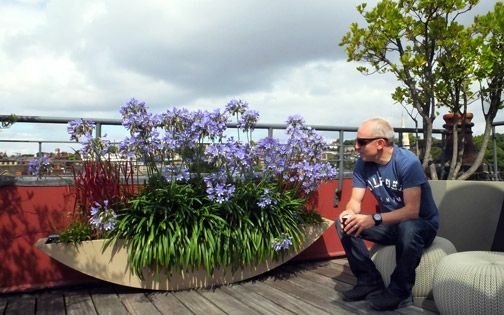 A large-scale square planter, designed in a wider outline, is not only well balanced visually, but also enables greater planting depth and further space to mulch its top surface with ornamental stones – such as the quartz pieces in this small roof garden. 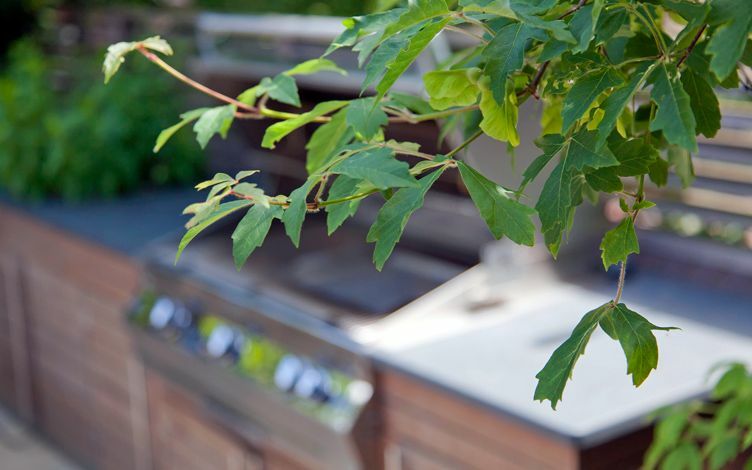 The Paperbark maple blends into its woodland backdrop with a deciduous silhouette which lets light through coppery branches in winter, and makes its mark here in a North London garden with grace, balance and charisma.